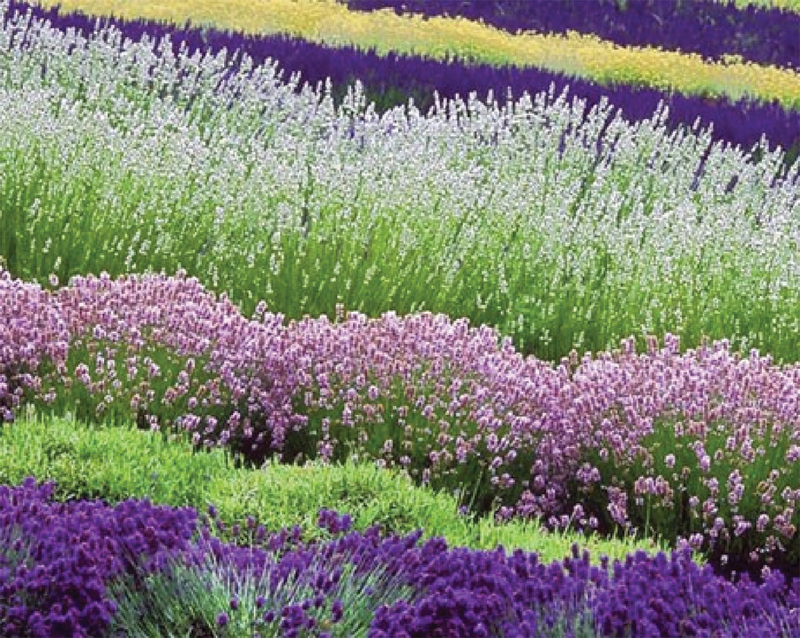 Lavender Essential Oil has had a long tradition. The person who first coined the term aromatherapy was Rene-Maurice Gattefosse. He was working in a perfumery business when he got a severe burn and he stuck his hand in a vat of Lavender Essential Oil. As a result his hand healed quite rapidly with little scarring. Lavender was thus there at the start of modern day aromatherapy. The scent of Lavender is usually familiar to everyone with its fresh herbaceous, floral aroma. This little oil has over 100 constituents including linalyl acetate, linalool, camphor, limonene, tannins, triterpenes. It’s amazing to me that how these different components make up each species of Lavender and determines how the Lavender smells and what its properties are. There are many sorts of Lavender. There is the traditional English Lavender ( lavender augustafolia) and Spanish Lavender and French Lavender. There is also cultivars of Lavendins, Lavender Grosso, Lavender Provence, Bulgarian Lavender, Lavender from Hungary and Spike Lavender. It’s enough to make your head spin a bit and all these Lavenders have different varieties of scent. All are varieties of Lavender but where it grows affects the chemical makeup of the plant and the final scent of the flowers. This also greatly this affects the therapeutic properties of the Essential Oil. Lavender is a versatile oil that blends with many other scents from the citrus scents like Orange and Grapefruit, to the mints and to the really earthy oils of Patchouli and Oakmoss. I also use Lavender in my Soaking Salts as the EO has the therapeutic properties to be sedative, antidepressant and analgesic which is great after a stressful day at work! If you are adding just the EO to your bath, only add about 5-6 drops to you bath water as you will be inhaling the scent through you nose and into you skin. EO’s are very concentrated and as the saying goes “less is more”. Please note these are properties not prescribed by medical field but from aromatherapy sites and are anecdotal only. I also use Lavender in my lotion bars as much for the scent as for its known for being antiseptic and antibacterial which has skin soothing properties. I also add a bit of Lavender EO in my herbal salve as well as Tea Tree and Blue Chamomile EO’s. A wonderful book by Valerie Ann Worwood titled The Fragrant Heavens talks about the spiritual dimension of fragrances and she writes about Lavender being ” caring, cherishing, and nurturing ” and an oil that uplifts the spirit. Lavender is a physically and emotionally healing oil and I hope you will welcome it into you daily life. What’s all the buzz about herbal teas? You know the weekend of Joaquin well….. I love lavender! It’s so relaxing and healing. It’s probably the most used essential oil in my arsenal. Everyday I drink a chamomile and lavender tea and I love lavender in cooking. You can infuse whipping cream with lavender to make a great ice cream or cake filling. Claire that infusing whipping cream sounds an awesome idea. Thanks! Nice article. I learned a few things. Now if I can only remember them.